A lot of people struggle when it comes to coming up with good content ideas for their blog posts. Obviously they all can’t be winners, but everyone feels the pressure to come up with something worthwhile, meaningful, and engaging. At the end of the day, that’s what blogging is all about, right? I, too, have been in the hot seat with a mind running on empty, and I’ve developed a few easy tricks to help me come up with good content. If I need a blog topic and I’m looking for inspiration, one of my favorite places to check out is Google’s Insights for Search tool. Remember that post about The Avengers as social media, or the one I wrote about Instagram mistakes to for brand to avoid in the wake of Instagram’s $1 billion buy-up? Yep, both were directly inspired by the then-trending searches on Google Insights for search. 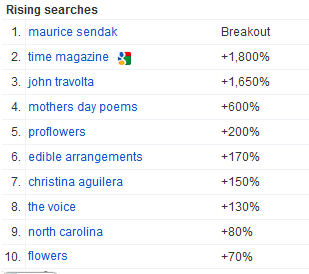 Right now, Maurice Sendak and Time Magazine are trending, along with a mess of Mother’s Day related searches. If I wasn’t already writing about post inspiration, I’d probably see if there was an appropriate ‘Where the Wild Things Are’ or ‘Mother’s Day and Social Media’ tie-in for a post today. Personally I try and exercise good taste when looking for topics – it would be inappropriate to try a to tie-in a natural disaster or national tragedy to social media. If you’re still not seeing something that you like, or you’re working on a more localized blog, try adjusting the settings for longer and shorter time periods and for more specific areas. 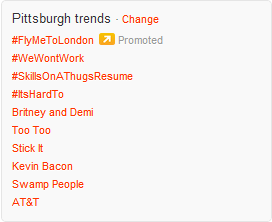 Again, another pretty straightforward source is Twitter’s trending topics section. Granted, it can be something of a crap shoot – ‘Britney and Demi’ or ‘SkillsOnAThugsResume’ don’t really have much to offer social media-wise (unless the thug is @HologramTupac, of course), but you can also adjust your location settings and try and surface some content ideas with that tool as well. It goes without saying your Twitter Feed itself can be a great source of inspiration in-and-of itself. Probably one of the best sources for inspiration is the content that you’ve created yourself. Take a look at your Google Analytics and see what kinds of content have brought in a lot of traffic for your blog – for instance, Christina Keffer has written an excellent piece on creating and tracking QR codes that routinely gets us a ton of traffic. A follow-up post updating changes in the industry or reflecting on further best practices is a ripe topic for a new post. This is almost too obvious, but many blogs forget that the whole reason they exist is to help facilitate engagement with their customers and industry peers. If your blog is mature enough to regularly receive comments and contributions from followers, look to those for inspiration for a new post. For instance, another extremely popular post we have is a post written by Brian Honigman on how to manage a Facebook page with the then-newly updated Facebook App for iPhone. It’s a great piece, so good in fact that many people ask us questions peripheral to the post’s topic. After getting a ton of questions about problems with postings and bugs in the app, I realized it would be a great topic for a new post (and save me a lot of repeated answers) to quickly go over some ways to troubleshoot problems with the app. This can work for Facebook likes or comments, Google+ shares or interactions, and Twitter retweets or reactions too. Just find good content to build off of and make sure to let any contributors know about your new post. Sites like Quora, LinkedIn Answers, Focus, and any other industry-related hubs like forums and popular blogs, can provide you with great inspiration for topics and posts and come with the added benefit of having a built in added audience member. At LunaMetrics, we do a weekly show centered around questions from these sources for precisely that reason – it helps us grow our audience and establish our authority on our respective specialties. Simply find a question, or group of questions, on any of the aforementioned sites, write out a thorough response, and post it as a link on the original question. Probably one of my favorite places to get inspired with new content and campaign ideas is the built-in analytics suite in Facebook, called ‘Facebook Insights’. Open up your analytics, load up analytics for a little way back, and begin sorting by engagement and stories about this to get some ideas for what kinds of content your user base is engaging with. For instance, I took a look at our post analytics and found that the most engaging content we posted to Facebook routinely featured one or more of the LunaMetrics team directly in the content (We’re a good-looking bunch, so we can’t say we’re too surprised). Using that insight, we started generating content that was more company-centric – like photos of LunaMetrics team members presenting helpful tips, our new LunaTV segment, and pictures from around the office. Our engagement numbers have been through the roof! Checking your own analytics is a great way to see what’s connecting with your audience, and a chance to dig a little deeper and find out why. That, in turn, means more optimized content for your fan base! Win-win. Hopefully you found a few new places to add to your checklist of sources for inspiration the next time you’re faced with a deadline and a mind full of blanks. Do you have a special trick to surfacing content ideas for your blogs? Tell us what tools you use in the comments!